Constantly we receive calls and emails from people, especially foreigners, that want to buy properties in Miami but have no idea where to start and the unfamiliar terrain intimidates them. The process of buying a home, house, apartment or mansion is very similar but varies depending on whether it is a new home/pre-construction or resale property. 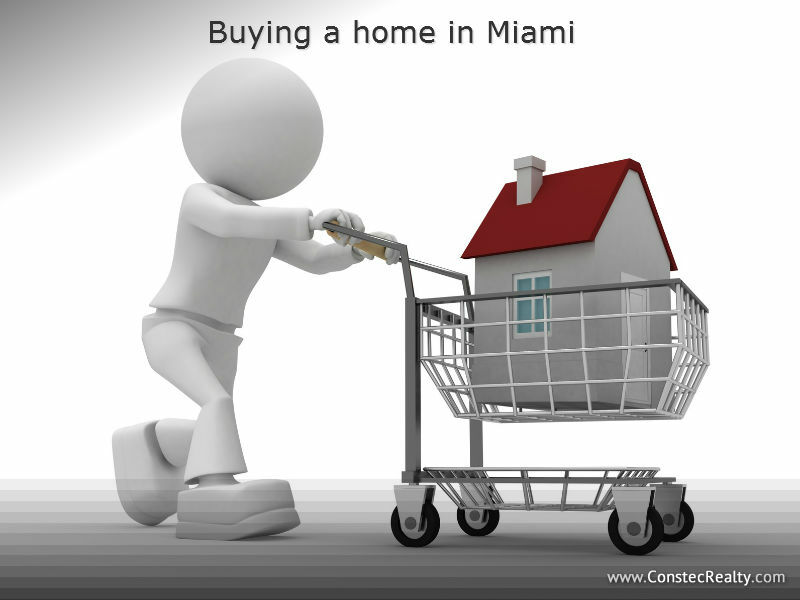 Here we describe the process and the most important points to understand when buying a property in Miami. The first point I want to make clear is that the buyer does not pay the commission to the agent/realtor who is working for him. In all cases, the commission of the agent working for the buyer is paid by the seller at the day of closing. The seller pays the commission to both agents/brokers, the one representing the buyer and the one representing the seller. The commission is established from the moment that the property is available on the market and it is split equally between the two agents. When buying pre construction the commission of the agent/realtor representing the buyer is paid by the developer of the project. Foreigners can buy any type of real estate property in Miami; it all depends on the needs and financial capability of the buyer. As you contact us let us know what you are looking: If you prefer something in pre construction or finished; which areas you are interested in, price range, number of bedrooms and bathrooms and any other characteristic that is important to you. The more information you give us the better we will be able to serve you. With this information we provide you with a list of all the properties available in the market based on your purchasing needs, this can include, of course, different areas and different type of properties. In Miami (USA), unlike many countries, realtors have access to all properties available in the market. Real estate companies and brokers use a shared system with a full database of properties for sale or for rent called the MLS (multiple listing services). Real estate agents, as well as real estate companies collaborate with each other and compensate each other creating a database with thousands of properties. The beneficiary is the buyer as he avoids having to go from office to office in search of the ideal property. We can show you everything available that suits your needs. Once you pre-selected the properties that most interest you, we make appointments to go to visit them. We make visits until we find the house, condo or property that is right for you and your needs. If you prefer buying pre construction in Miami, we send all the information about the projects: plans, finishes, services, maintenance cost, photos, prices and all units available that suit your taste and needs. We also take our clients to pre-construction sales centers where you can see the finishes, layouts and views that the units will have. We also negotiate the contract for you and accompany you in every step. Foreigners who buy a residential property in Miami have the option to obtain financing. Usually, foreigners need to contribute around 30% to 40% of the purchase price. The financing will also depend on the cost of the property or if the property is in a condo building or condo hotel residence. Financing plans and prices vary dependent on assets and income of the buyer, use of property (i.e. investment property, second home, primary residence) and the type of property you want to buy. Of course, you can also make your purchase in cash. You must ensure that funds are in a bank in the United States or that they can be transferred to an account here. 20% with the signing of the contract. 30% divided into two or three parts during construction. 50% with the delivery of the property. For the last 50% you could seek financing on your own but purchase contracts for preconstruction property are most of the time cash contracts. Once you have chosen the property we will prepare and present an offer; which is actually a contract of sale. In order to make the most educated decision possible; before making the offer, we will inform you which are the latest comparable sales in the area, the conditions under which these properties were sold, the market trend in the area and improvements or deteriorations in the area in terms of the present and future. We do this analysis in order to present a real and fair offer. The offer is accompanied by a good faith deposit generally between 5% and 10% of the purchase price of the property, which is deposited in an escrow or trust account with a real estate lawyer. Of course, before making the offer we will inform you all the details of the purchase, the amount of property taxes, maintenance costs or administration if the property is located in condo building or gated community. We will provide you the statutes and rules of the community and help you with the application process. Once the offer is accepted and the negotiation is completed, the process of transferring ownership officially begins. This process is complex and requires the assistance of several professionals and several steps. (This process we do in collaboration with other professionals such as inspectors, lawyers, etc.) The contract of sale is a legal document with different expiration dates, which have to be met exactly as specified in the contract to avoid penalties and cancellation. The culmination of the process of buying a property in Miami is commonly referred to as closing. On closing day, the seller, buyer, real estate agent, lawyer of each party and a notary public meet at the closing table in the real estate company or the title company. Importantly, the parties (seller, buyer) do not need to be in person for the time of closing. Today you can receive documents electronically, sign documents before closing and courier documents back to closing agent. The buyer must have made a transfer of the remaining funds to the account of the closing agent at least one day before the closing date. Personal checks, traveler’s checks, cash, etc. are not accepted. When you buy a property in Miami there are charges associated with the transfer which are called closing costs. These are in addition to the purchase price and most of them have to be settled at closing. The buyer must bring a check for the purchase price plus closing costs which is usually between 1 and 2% of the value of the property (excluding costs associated with loan in the event there is financing). If the buyer used a mortgage to purchase the property, the title company will explain all the documents to be signed, such as: note and mortgage, all the forms associated with the mortgage, the closing statement, which details all the costs associated with the transfer of ownership. The closing company or the real estate attorney is the authority responsible for distributing the funds to the appropriate parties. There is no exchange between the buyer and the seller; it is all done through the real estate attorney / title company. If the buyer obtained a mortgage, the bank gives precise instructions to the title company to deliver the funds to the seller once all requirements are completed. Zoloft is prescribed for depression of various origins, with anxiety-depressive states, insomnia, phobias, panic disorder, obsessive-compulsive neurosis. It is intended to treat and prevent posttraumatic psychiatric and sensory disorders, with a pronounced social phobia. Once all funds were distributed, delivering keys it is the most exciting part and the climax of this process. Always be sure to get all the keys for the house as well as the ones for the garage, electronic keys, mail keys, the keys of the storage units, etc. Also the seller must give the new owner all valid guarantees, like alarm system and appliances and the list of service providers.